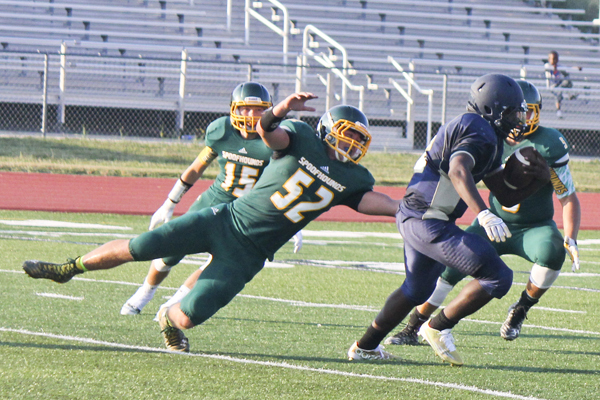 Defense was the name of the game Friday night at the Independence District Stadium at William Chrisman as high school football kicked off in earnest. Points were at a premium as Center, Lee’s Summit North, Maryville and William Chrisman met on the gridiron for a series of 24-play matchups. Lee’s Summit North, which is searching for a “new identity” under first-year head coach Jamar Mozee, utilized its numbers advantage to post the majority of the offensive highlights. The Broncos, who went 1-9 last season, were the lone team to score on Class 3 Maryville, which went 12-1 last year, losing to eventual state champion Oak Grove in the state quarterfinals, punching in a 6-yard run on the second to last play of the initial scrimmage. The Spoofhounds, who are 42-1 in three years under Matt Webb, put up a single score on Center, when junior quarterback Trey Oglesby floated to senior running back Dakota Beemer in the corner of the end zone to cap their first drive. Maryville junior linebacker Elijah Green, returning from a broken leg that caused him to miss most of the 2014 season, picked off a tipped pass to thwart the Yellowjackets’ first drive and bent — allowing a 10-play drive — but never broke. Center also went back and forth with Chrisman before the Broncos’ depth wore out the Yellowjackets, who are trying to build on an 8-3 season from a year ago. Maryville rounded out the evening by shutting down the Bears and posting drives of five and seven plays, both of which ended in touchdowns — the first a 1-yard run by junior fullback Matt Twaddle then a 5-yard pass from sophomore Will Walker to sophomore running back Jacob Reuter. William Chrisman coach Scorpio Horn, heading into his second season after a 1-9 initial campaign, said he was proud of the way his team competed with each of the squads in attendance. “I’m excited that our guys didn’t put their heads down, they didn’t quit,” Horn said. “You can feel it (the culture) changing. It’s the second year, but I can feel it changing. Lee’s Summit North opens the 2015 season at home against Park Hill South Aug. 21 while Chrisman hosts Platte County and Maryville welcomes Lawson. Center kicks off the year on the road at University Academy.